In today’s edition of Stating the Obvious: The Minnesota Golden Gophers are a better basketball team when they get up and down the floor. That was apparent in Sunday’s 92-87 victory against Top 25 Iowa. So was freshman Gabe Kalscheur’s impact. The Gophers had slogged their way through the previous two games offensively: the first, a narrow 65-64 win over Penn State; the second, a 59-57 loss at the buzzer at Michigan. Minnesota’s half-court offense, at times, seemed to be merely a clock-killing mechanism as possessions didn’t begin to develop until 10 seconds remained on the shot clock. Despite running the fourth-highest-tempo offense in the Big Ten, per KenPom’s adjusted tempo rankings, the Gophers found themselves in an offensive rut. Enter, Iowa. The Gophers got to unleash their offensive best, scoring their most first-half points since early in the 2014-15 season. The 55 they scored against the Hawkeyes by halftime was two points shy of their full-game output at Michigan. Kalscheur finished the game with 19 points on 7-of-16 shooting, tying his most shot attempts of the season — six more attempts than any of his previous eight Big Ten games. Not only that, but he helped slow Iowa’s guards defensively, particularly Jordan Bohannon and Joe Wieskamp, who combind for five points on 1-of-5 shooting. Offensively, the tempo clearly benefited Kalscheur and the Gophers. Their 25 assists were the most since the season opener. Kalscheur’s presence as the team’s finest catch-and-shoot 3-point threat gets accentuated when the ball moves faster, whether that’s north and south in the full court or east and west in the half court. That was fun. Hot-shooting @GopherMBB takes down No. 19 Iowa. Kalscheur was active inside the 3-point line as well, going 4 of 6 from two-point range, only the second time he’s made more than a pair of two-point field goals in a game. 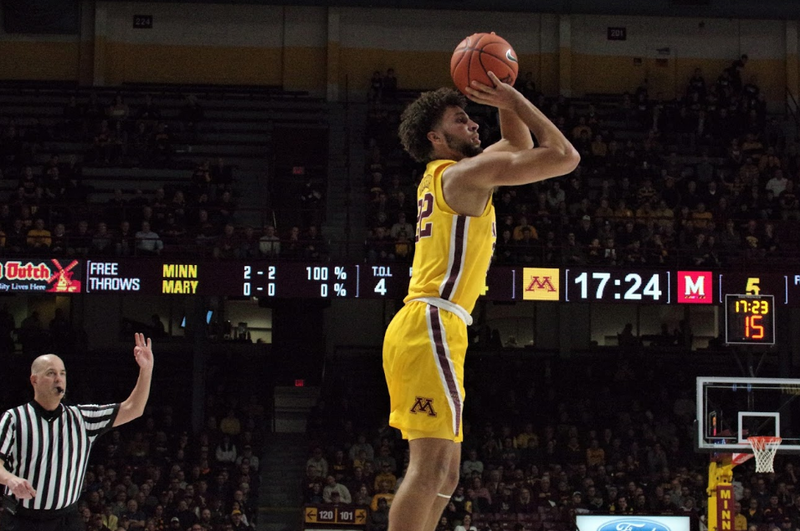 His critical off-the-dribble jump shot with 1:46 remaining gave Minnesota a six-point lead and snapped a 4-minute, 4-second field-goal drought. Still a first-year player, Kalscheur has often faded in the offense if shots weren’t created for him organically. He took matters into his own hands Sunday with more assertive drives to the basket as the Hawkeyes’ defense was stretched thin during the first half onslaught. While he’s not yet as physically gifted as Coffey to maneuver around the rim, he’s developed a sharp mid-range jump shot and a consistent floater in the paint. Kalscheur’s pump fake has become a valuable weapon as defenders routinely fly out at him on the 3-point line, only to whiff as Kalscheur ducks under the lunge and resets for the jumper, or takes off toward the lane. While he’s the team’s best 3-point shooter of players with over 15 attempts, he still ranks ninth on the Gophers in field-goal percentage because of his lack of consistency inside the arc. Minnesota’s up-tempo style should only bolster Kalscheur’s impact if the team smartly finds him on the break. Kalscheur took six 3s in the first half Sunday, which appeared to strain Iowa’s defense and led to 24 points in the paint for Minnesota — even without center Daniel Oturu (shoulder). Hawkeyes coach Fran McCaffery benched many of his starters early in the second half because of their effort as the Gophers built a 16-point lead before Iowa mounted its final, and ultimately fruitless, charge. Iowa got up and down the floor as well, getting 66 combined points from starters Isaiah Moss, Luka Garza and Tyler Cook. But Kalscheur’s defense on the perimeter often shut down Bohannon, a double-figure scoring threat. Perimeter defense has been the Gophers’ kryptonite in recent seasons (their 3-point defense is still third-worst in the Big Ten). Even with Bohannon being a non-factor, Iowa went 10 of 18 from beyond the arc. Kalscheur’s team-low defensive rating, per Basketball Reference, paints a picture of a struggling freshman, but Pitino often matches the DeLaSalle product up with the opponents’ top player, many of whom are taking a higher volume of shots and deflating Kalscheur’s analytics. Sunday there was no give on either end from Kalscheur, who was visible as a much-needed third offensive weapon to add to Coffey and Jordan Murphy. And his defensive brilliance was noticeable.